Celebrity Look for Less: Kristin Cavallari! It’s time for another Celeb Look for Less!!! Time to match up with my fave Chicago Bears wife and shoe designer, Kristin Cavallari! For this look I used things that I already have in my closet- So you see how fun and easy it is to remix your wardrobe without shopping or breaking the bank! 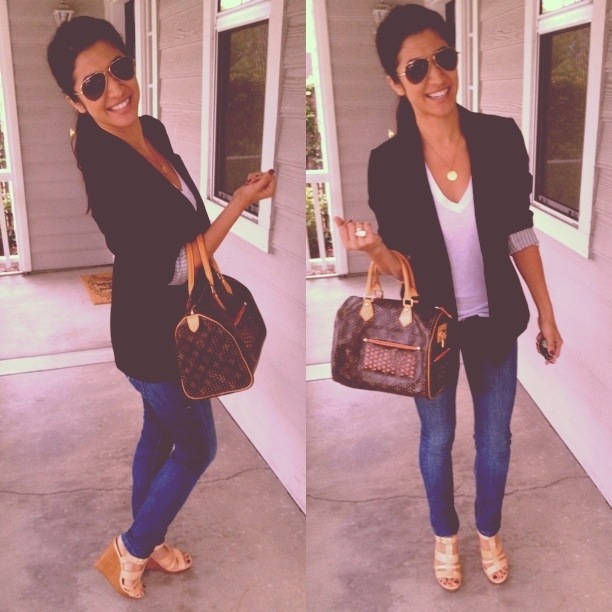 She’s rocking her blazer, skinnies, and Louis Vuitton Classic Speedy Bag. I added the shades and pendant necklace. Details on my look: BOYFRIEND BLAZER: H&M London (about $20), SHIRT: Victoria’s Secret PINK (about $12), JEANS: William Rast by Justin Timberlake ($30), SHOES: Jessica Simpson (and they are SO comfortable, $30), GLASSES: SALT. optics, NECKLACE: Max & Chloe, RING: Kendra Scott, Cora Ring in Ivory. Below: Fun Instagram pic! Follow @fashionbeautysisters. I loved doing this look for less! So fun, and super comfortable! Love this look! You look great! I want a necklace like that too!